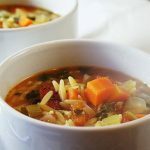 Vegetable Orzo Soup a delicious soup made vegetables and everyday ingredients. These easy flavors come together in a snap and it's a healthy meal packed full of flavor! Dice the carrots, celery & onion. Heat a large stockpot over medium heat. When it is good & hot, add the olive oil. Then add the carrots, celery, onion and the spices - Italian seasoning, salt, pepper and red pepper flakes. Sauté for 4-5 minutes until the vegetables begin to soften. Add in the garlic & sauté for about another minute, until the garlic becomes fragrant. Run your knife thru the spinach a couple times, chopping it into bite sized pieces. Add it to the soup pot. Next add the pasta and give everything a good stir. Poor in the tomatoes, stock and water. Increase the heat to high and stir well to combine. Bring to a boil, then reduce the heat to medium - you'll still want to keep it a light bubble and cook until the orzo is cooked thru - about 8-9 minutes. Continue to stir the soup often. The orzo has a tendency to stick to the bottom of the pan. In addition, stirring it will release the starches in the pasta and help to thicken the soup.